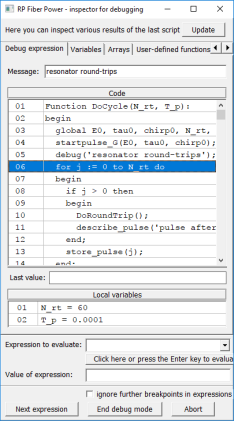 Spectrograms of simulated optical pulses can be made with the software RP Fiber Power or RP ProPulse. where E(t) is the signal under investigation (e.g. the electric field of a pulse) and g(t) is a gate function, which may e.g. have a Gaussian shape. The temporally narrower the gain function, the higher is the temporal resolution, but also the lower is the spectral resolution. Therefore, the choice of gate function (and particularly its width) has a substantial influence on the resulting spectrograms. It is common to use a horizontal time axis and a vertical frequency (or wavelength) axis, and to encode the intensity for each combination of time and frequency with a gray scale or a color scale. The result is intuitive e.g. for an up-chirped ultrashort pulse (see Figure 1). The spectrogram shown in Figure 1 is reminiscent of a graph showing the instantaneous frequency as a function of time. However, a vertical slice of the spectrogram always has some finite width, whereas the instantaneous frequency at any temporal position is a sharply defined value. Figure 1: Spectrogram of an ultrashort pulse with a pronounced up-chirp, i.e., with a rising instantaneous frequency. 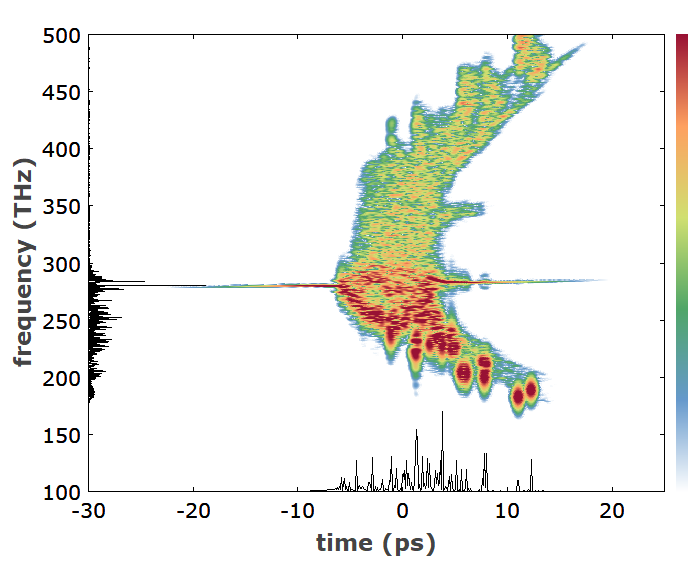 Figure 2, an animated spectrogram, shows how a third-order soliton pulse evolves in a fiber. The label (upper right side) indicates at which position in the fiber the pulse is currently displayed. One recognizes that both up- and down-chirps occur during the pulse evolution. Figure 2: This animated spectrogram shows how a third-order soliton evolves in a fiber. Solitons of higher orders exhibit even more complicated behavior. 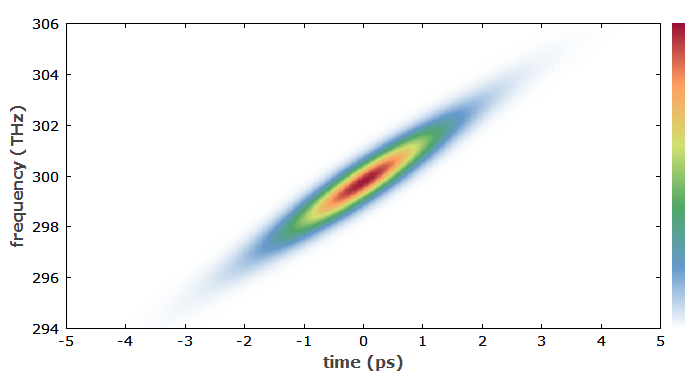 Figure 3 shows the spectrogram of an ultrashort pulse after passage through a photonic crystal fiber, in which supercontinuum generation occurred as a result of strong nonlinearities, with a strong influence of chromatic dispersion. In order to span a wider range of spectral intensities, a logarithmic color scale has been chosen. The pulse has split up into several pulses (soliton fission), as the temporal trace (black trace at the bottom) shows. The lower part of the diagram shows various bright spots representing soliton pulses, which carry a significant part of the overall energy. Figure 3: Spectrogram of a supercontinuum, simulated with the software RP ProPulse. A logarithmic color scale is used. It is also apparent that there is some unconverted light from the wings of the initial pulse (horizontal line in the middle) and a weak background extending to high optical frequencies. That background is to some extent correlated with the above-mentioned solitons, because it is generated in a phase-matched four-wave mixing process. Both the lowest and the highest frequency components exhibit a larger time delay than the medium frequency components; this is due to the chromatic dispersion of the fiber, which has its zero-dispersion wavelength near 1 μm.